Are The Old Synagogues of Eastern Europe Worth Saving? A Question Revisited: Are The Old Synagogues of Eastern Europe Worth Saving? Home / Latest / A Question Revisited: Are The Old Synagogues of Eastern Europe Worth Saving? I traveled to Poland in October 1989 as Central and Eastern Europe was emerging from a half-century of Nazi occupation and Communist rule. Solidarity had already set Poland firmly in the direction of democracy. Hungary and Czechoslovakia approved revolutionary reforms, with little bloodshed, during or just after my trip. In a timely assignment, the Jewish Heritage Council of the World Monuments Fund asked me to bring back information about the condition of the cemeteries, synagogues, cultural and educational centers, and other significant buildings associated with the once extensive Jewish presence dating back almost a thousand years. What remains? Should they be restored? If so, why? And how? At a time when the world was still absorbing information about the horrific loss of Jewish lives during the Holocaust, many of my American colleagues were puzzled and skeptical, even hostile: There’s nothing left, they typically said. Or if there is, so what? There are no Jews left. Money is needed for people, not places. References to Poland met with especially bitter responses. As the daughter of immigrants from Poland and a preservation and environmental planner who had helped to identify and rescue neglected cultural and architectural gems in older American cities, I instinctively felt there was a different story. A few years earlier, visiting Poland for an international report on urban revitalization, I saw how skillfully Polish planners, conservators and artists had restored the Old City of Warsaw and centuries-old churches and castles. The reasons why the Polish government, even under Communism, took pride in restoring what they viewed as their national patrimony seemed applicable to the historic homeland of so many American Jews. So, in those days before computers and e-mail were widely available, I faxed Poles in and out of government who we thought could help this mission. Although I received no responses and phone service was poor, once in Poland I found people–Christians and Jews–eagerly awaiting my arrival and primed to share privately gathered documentation of Jewish sites, pulling out dusty, neatly tied folders, hand-written research notes, old photographs, and historic texts. Planners Marie and Maciej Piechotka, authors of the classic text on wooden synagogues, were my guides on a circle tour between Warsaw and Bialystock fueled by furtive purchases of gas from local farms. I talked with members of the once vibrant, now few and forlorn, Jewish communities. I walked gingerly near roads Nazis had constructed with Jewish tombstones and visited deserted and looted synagogues that had been used as stables and storage. Many were weed-covered and near-ruins. 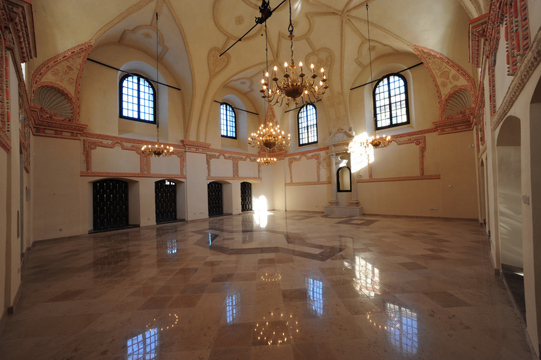 Amidst wrenching abuses, there were occasional surprises: a synagogue restored with public funds and used as a library or concert hall; a cemetery fenced by Hasids who had sent missions to protect the graves of charismatic tzadakim during the long totalitarian years; and local Poles who were keepers of the keys to abandoned or locked cemeteries. I also met with Polish cultural officials in Warsaw to inquire about the protections of the much-vaunted Polish monuments law and realized the chasm between tough regulatory language on paper and the real world. I hid my dismay when shown a thin folder that contained the documentation of landmarked Jewish sites. A numerical system ranked each site’s importance: most Jewish sites were rated 3 or 4, a signal to local officials that the site was not a priority for protection or funding. The paltry group reflected outdated narrow views of historic preservation and national patrimony as well as stretched funding, if not necessarily anti-Semitism. “For an American visitor, the surprise is that so much is left,” I later wrote in a Moment article that asked, are remnants of the historic Jewish presence in Poland worth saving? The question seems commonplace today, given the extraordinary efforts in the past 25 years by growing numbers of people in and beyond Poland–scholars, foundations, officials, educators, conservators, museum professionals, travel companies, journalists, preservationists–whose impact on the revival of Jewish life and culture has surpassed what could have been imagined in 1989. While many difficult questions of funding, governance, ownership, priorities, and use remain in a country with so few Jews, the answer is, clearly, yes. Phyllis Myers, a conservation policy and politics adviser to governments and private groups, has written widely on issues of historic and cultural preservation, with a special focus on democracy in development in Central and Eastern Europe.